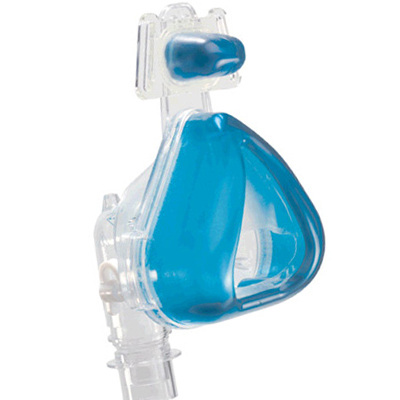 Note: Philips Respironics has discontinued production of this Profile Lite mask and there is no direct replacement. 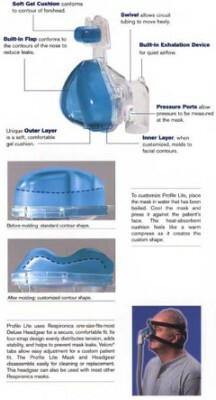 Similar Gel CPAP Masks are the ComfortGel Blue and the TrueBlue. With its softer, lighter cushion, Respironics Profile Lite Nasal Gel Mask is extremely comfortable right out of the box for most patients. The head straps dont need to be pulled as tightly to reduce leaks, and that could lead to improved patient compliance. The Profile Lite Nasal Gel Mask features a softer, lighter gel cushion and forehead pad that gently rests against a patients face for a soft, pillowy fit. This mask consists of four parts and just two that need to be cleaned, making it easier to use and care for than other masks. Not only is Profile Lite a comfortable off-the-shelf mask, its also a comfortable, fully customizable mask, too. The simple, 10-minute customization process molds the mask to the individuals facial contours for a personalized seal. Your patients can easily customize the mask on their own, and repeat the process as needed, to find the perfect fit. The Profile Lite Uses a one-size adjustable headgear that is interchangeable with most Respironics masks, and requires less tightening to ensure a seal, which means better comfort for you! The mask is very comfortable except for the film where the nose goes. It keeps getting in the way and I am considering cutting it out. I am going to duct tape the forehead piece as my previous mask had one and it fell off and could not be fixed with glue. Other than that this is the most comfy mask I have worn. The gel rocks. Exactly what I anticipated. Just wish you weren't sold out of the medium size. Response was quick and efficient. Received my shipment as promised. I love everything about this mask! This is my favorite mask to date. I have always had issues with the forehead piece breaking. This mask holds up the best to date. I am interested in trying one that is just for the nose. Some of those look interesting. Great product. Sad it's need misc.. Bring it back!!! Compared to some of the other masks I have had, it's definitely one of the better quality masks. The product arrived in good condition and in a timely manner. Good internet experience. Mask price is good. The internal nose piece that covers the nose should be remove. I am satisfied with my purchase of the Respironics Profile Lite Nasal w/headgear. It was comfortable after adjustments & did not have problems w/it. Better quality than I have gotten from my local home healthcare company. Quick shipping, less than 1/2 price was a big bonus! My mask arrived in record time, so great service. I just love the Profile Lite. I've tried a number of different models over the past 8 years and keep coming back to this one. It's so comfortable I barely notice it's on. I sleep on my stomach and have no problem with the mask forming a seal. Can't recommend the mask or BestCPAPPrice enough! I like the mask and the price and service were good. Item was exactly what I expected. Very good quality! It's wonderful! It stays in place all night and I never had that with my old mask.